Why? Because in addition to evoking a reality, they made it arise. In Ancient Egypt everything that was depicted was also happening. The Power of Scenes on Walls. 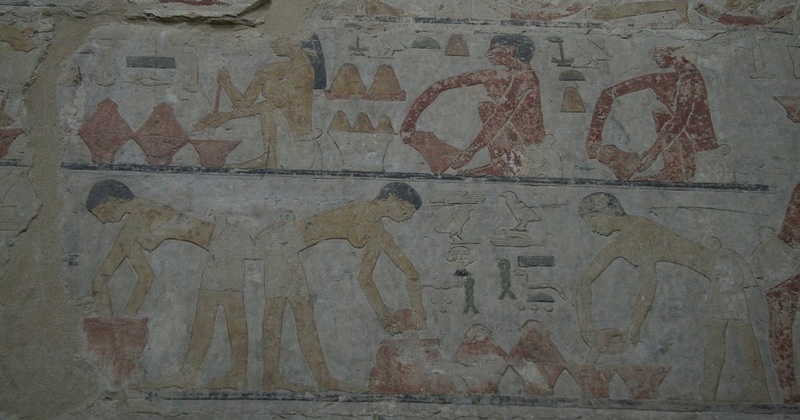 The mural scenes that we observe in the mastabas of the Old Kingdom depict very realistically scenes of daily life. However, they did not consist in the memory of an earthly world that the deceased wanted to take to the Hereafter. In the belief of Ancient Egypt those scenes were moments and situations that happened perpetually. Making Bread. Mastaba of Ty in Saqqara. V Dynasty. Photo: Mª Rosa Valdesogo. The depictions of bread manufacture or agricultural and livestock activities provided food for the dead eternally. The iconographic environment surrounding the deceased was an ideal reality in which he would live forever and which was in his best interest. In the same way, the ancient Egyptian reliefs that invaded the walls and columns of the temples (whether funerary or state) immortalized the rituals that took place in them. It was the way to make the rite always happen. 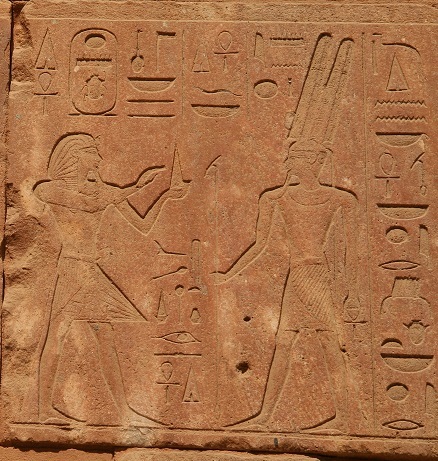 The images of the pharaoh making offerings to the deities indicated the function of the construction in which they were. In addition, they guaranteed the execution of that sacred gesture thanks to the magic of the image. Or, for example, the festival of Opet, which is represented in the temple of Luxor, was a living and eternal image of that celebration. In Ancient Egypt as long as the image existed, the festival was always going to happen. 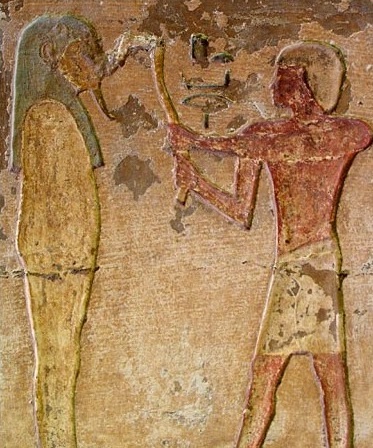 Tutmes III making offering to Amun-Ra. Karnak Trmplr. Photo: Mª Rosa Valdesogo. Statues in Ancient Egypt were also more than just effigies. The statuary enjoyed the same magical powers. 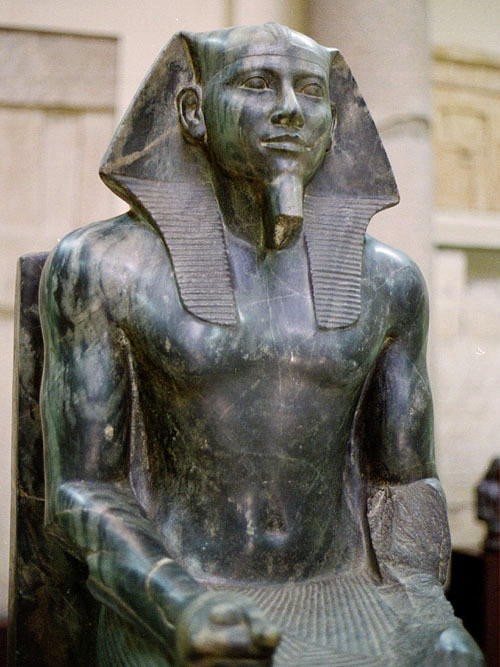 For the ancient Egyptians a sculpture was not a representation of a person, but was the person itself. The statues that were placed in the graves were the supports of the ka of the deceased. In Ancient Egypt, one of the primary ways of achieving immortality was the preservation of the body through mummification, since the preserved body was the first support of the ka. In case the body was corrupted, the statue of the deceased fulfilled that function. Thus the ka of the deceased, thanks to his effigy, benefited from the daily funeral ritual performed by the funeral priests. For that reason the rites of the funeral ceremony of opening the mouth (an ancient Egyptian ceremony for regenerating giving the dead back to life) could be performed on his mummy or on his statue. The sculptures had the same qualities as the human being, because they were those human beings that they reproduced. Therefore, the placement of statues in the tombs guaranteed eternity. The body, despite the mummification, could be spoiled, while the statue was less perishable. The same principle was the one that determined the placement of royal and private sculptures inside the state temples. The sculptures of the king in these sacred spaces, together with his two-dimensional images, guaranteed the presence and performance by him of the daily ritual. In the same way, the existence of statues of elite members made them also part of the cult life of the temple. The art in Ancient Egypt was utilitarian. The conclusion of what we have exposed is that the art of Ancient Egypt is a utilitarian art, since it has a specific purpose: magical operability. In ancient Egypt, art and magic go hand in hand. The statues are the people they depict and the mural images show what happens. The objective of a relief, a painting or a sculpture is precisely that which appears, because they are something that happens or someone that exists. We must also bear in mind that almost everything that has come from ancient Egypt is designed to last. If a statue was to be perpetual, it had to capture what was perennial, that is, the essence. That is why the important thing in a sculpture was, on the one hand, the indestructibility (hard materials, solids, non-brittle typologies), and on the other hand, the values ​​and the nature of the represented. He had to appear with a noble and serene gesture, at an ideal age and with ideal physical features for the sacred sphere to which he was destined (whether it was a temple or a tomb). Proof of this are the royal portraits of the IV Dynasty prototype of serenity, maturity, balance and nobility, characteristics intrinsic to the figure of the sovereign and which were the essence of the monarchy as an institution.